Our "Rhode" trip from Rhode Island to Florida. “Eating in is the new eating out” has become a MANTRA in my family. As we head home from our southern road trip, I’m hearing it more and more in my mind. If you are health CONSCIOUS, southern cuisine presents a special challenge. Grease and grits excite my brother, but don’t nearly have as much appeal to me. In the olden days, before fast food was available, eating out was more of an occasional treat than a daily routine. These days, eating out happens nearly as much, if not more than eating in. Fast food USHERED in convenience at the expense of nutrition. 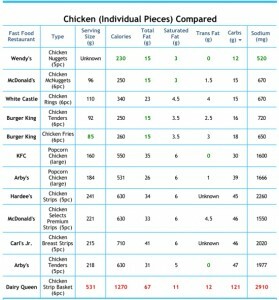 Chicken nuggets "nutrition facts" = oxymoron. I have had one too many plates of southern fried chicken, shrimp and grits and macaroni and cheese. Because we are on vacation for 10 days, we have eaten out at different restaurants, 30 times. Right now I’m craving vegetables, salad, fruit bowls, roasted chicken and every other “clean” food. 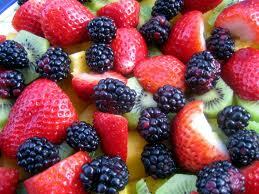 The advantage to eating in is that you can make exactly what you want and consume healthier and more nourishing food. For me, eating out just doesn’t have the same appeal as it used to. If we eat out with more rarity, then it just might put back the excitement into restaurants. This entry was posted in Travel, Vocabulary. Bookmark the permalink.